Greetings, forex friends! Tomorrow at 7:00 pm GMT, the Fed will announce its last monetary policy decision of the year, with a presser later at 7:30 pm GMT. And if you need to know what to expect, as well as a quick review of the previous FOMC statement, then you better read up on today’s write-up. The Fed announced during the November 8 FOMC statement that it decided to maintain its current monetary policy, so the target range for the Federal Funds Rate was still between 2.00% – 2.25%. The decision to keep rates steady while keeping the door open for a December rate hike was within expectations. And the same can be said for the Fed’s upbeat assessment of the U.S. economy and “roughly balanced” outlook. Even so, USD bulls jumped for joy and there was even some follow-through buying. The Fed will be announcing its monetary policy decision tomorrow. And the base case scenario is that the Fed will announce another 25 basis points rate hike. Also, the U.S. economy is evolving mostly within the Fed’s expectations. And for reference, here are the Fed’s latest forecasts, as laid out in the September FOMC Economic Projections. The second estimate for U.S. Q3 GDP printed a 3.0% year-on-year expansion, which is a tick slower compared to the Fed’s median forecast of 3.1% year-on-year by Q4, but within the central forecast tendency of 3.0% – 3.2%, so the U.S. economy is still evolving somewhat within expectations. The November NFP report showed that the jobless rate held steady at the 49-year low of 3.7% for the third consecutive month, so the three-month average come in at 3.7%. And that’s meeting the Fed’s own forecast of 3.7% by year-end. Anyhow, a rate hike announcement is usually USD positive, but since a rate hike is widely expected, there’s a chance that the event may be a dud and may even prompt some USD bulls to unwind some of their positions ahead of the FOMC presser. However, that would also depend on the Fed’s updated economic projections and dot plot. And traders will very likely have their sights on the projected path for the Fed Funds Rate. And just to recap, the September FOMC Economic Projections showed that the Fed is open to three more hikes in 2019 and then one more hike in 2020. If the projected path for the Fed Funds Rate is downgraded, then that will very likely be bad news for the Greenback. Conversely, if the Fed upgrades the projected path of the Fed Funds Rate, then that will very likely be positive for USD. But if the projected path for the Fed Funds Rate is unchanged, that will probably be interpreted as USD positive. 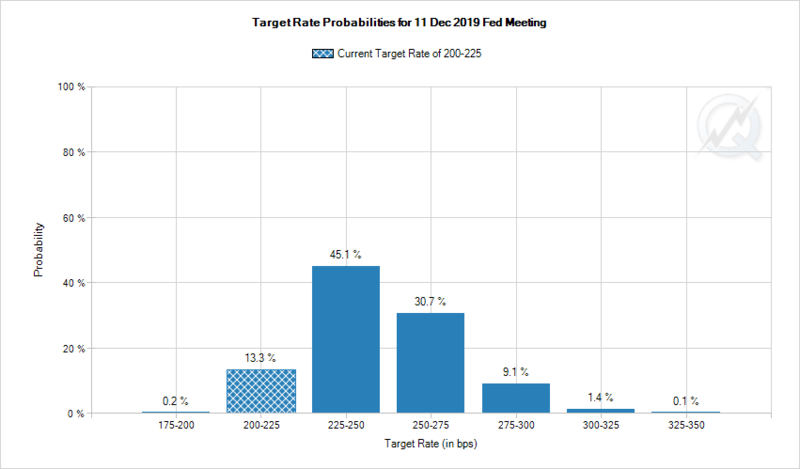 After all, the CME Group’s FedWatch Tool shows that the market thinks that there’s only a 41.4% probability of ONE more rate hike by the December 2019 FOMC statement and a 58.6% probability that the Fed will not hike throughout 2019. However, follow-through buying and selling will likely depend on the presser, so keep an ear out on what Fed Chair Powell has to say. And if you didn’t know, you can watch a live stream of the presser here. Anyhow, if news trading ain’t your thing or if high volatility makes you uncomfortable, then just remember that you always have the option to sit on the sidelines and wait for things to settle down.